Hi everyone! I am so sorry it has taken me a while to catch up with you! The holidays have made everything a little crazy. But that's the way I like it anyway! I finally found a window of time to check out another studio this week. I visited Studio East 54! It is located at 2140 Environ Way (in Chapel Hill), and is really worth visiting! Click here to check view their website. Super cute and trendy entrance! and the third room is much smaller, with Pilates reformer machines. This is not the actual room, but this is what Pilates reformers look like. Studio East 54 is different from most of the fitness studios I have visited lately because it offers a variety of classes. I imagine that's really nice for the clients who have packages here.. they can visit the studio every day and do something totally different! Studio East has TRX classes.. remember the body weight suspension bands at Orange Theory Fitness? Yup they have full classes with those here! There are some examples of what you would do during a TRX class. They have Zumba, the latin infused dance cardio classes, and Zumba with weights classes! They have personal pilates training classes with the Pilates reformer machines and something that I was really excited to try called.. Xtend Barre! Xtend Barre is a licensed Barre class and is carried in a variety of studios across the US. I had heard about it from some of our Pure Barre clients one day. I was interested to compare it to Pure Barre. I really LOVE my barre classes. And I can't say that Pure Barre is the best, and my favorite if I haven't tried the others! Xtend barre works the same muscles as Pure Barre. Both workouts use a ball, the ballet barre (obviously) and sometimes a small circular tube. They are both set to upbeat music, and are challenging for core strength and flexibilty. However, the classes are still definitely very different! The movements in Xtend barre are much bigger, and bouncier than Pure Barre, and Xtend Barre uses ballet terms (like releve, plie, and passe) and Pure Barre just uses.. well english. 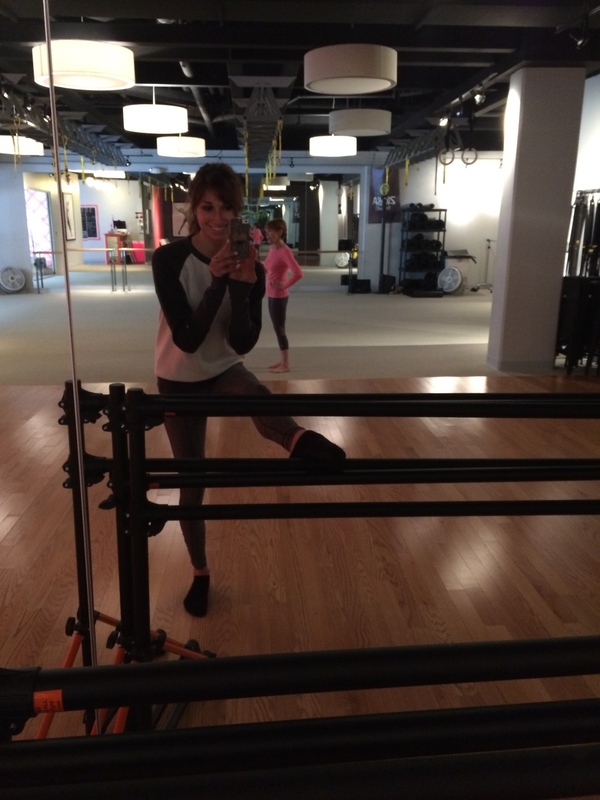 I definitely enjoyed Xtend Barre, but Pure Barre will remain my favorite! I really loved our instructor Anna. I had heard raves about her from my friend and I can see why! She was so supportive and encouraging during our class. She remained uplifting and positive the entire time. The clients were also very kind and welcoming to me as a new client, which makes the BIGGEST difference for someone's experience. My class was also free as a new client, which is AMAZING! I really had a great time at the studio and I am so glad I went. I will definitely be returning to try one of their TRX classes! Sending love from the barre this chilly December day! Newer PostPure Barre Training Weekend!